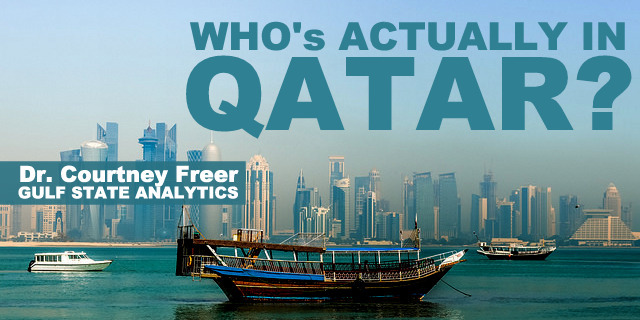 Home / Iran / Iraq / Muslim Brotherhood / Opinion / Qatar / Saudi Arabia / Shia / Sunni / The Middle East / Who’s Actually in Qatar? The latest scandal in the ongoing Gulf Cooperation Council (GCC) crisis revealed email leaks from Emirati Ambassador to the United States Yousif al-Otaiba about his country’s desire to host an embassy for the Taliban. The week prior to this revelation, Abu Dhabi’s ambassador to Washington publicly spoke about his suspicions of Qatar hosting the Taliban in an interview with Charlie Rose: “I don’t think it is a coincidence that inside Doha you have the Hamas leadership, you have a Taliban embassy, you have the Muslim Brotherhood leadership.” This latest rhetoric comes amidst a barrage of articles in the Emirati and Saudi press claiming to expose historical links between the Qatari government and the Muslim Brotherhood, despite the fact that all GCC states took in large numbers of Brotherhood sympathizers during the 1950s and 1960s, with several in powerful public positions into the late 1970s. In the face of increasingly polarized media output and official rhetoric, what is missing is an examination of (a) who has found refuge in Qatar and (b) the extent to which the Qatari leadership’s hosting of certain prominent personalities is based on ideological links. In terms of Islamist figures who have found refuge in Qatar, they are by no means all linked to the Muslim Brotherhood, yet there is an increasing tendency to paint all Islamists with the wide brush of the Muslim Brotherhood label. Aside from al-Qaradawi, Hamas leader Khaled Meshaal is the best known, though Hamas has repeatedly, over the past year, sought to separate itself from the Muslim Brotherhood. Further, controversial preachers like Jamaican-born Canadian Bilal Philips and American Wagdy Ghoneim, Libyan cleric Ali al-Sallabi, and former Algerian Islamic Salvation Front (FIS) leader Abbasi Madani have also found refuge in Qatar. Exiled Chechen ex-president Zelimkhan Yandarbiyev did so too, though he was killed by a car bomb in Doha in 2004; he also seemed more linked to Salafism than to Muslim Brotherhood ideology. Although these Islamist figures come from varying nationalities and strands of the faith, their presence is construed as evidence of the Qatari government’s sympathy toward the Muslim Brotherhood. Qatar’s attitude toward the Muslim Brotherhood specifically, and Islamists more generally, is certainly far friendlier than that of Saudi Arabia or the UAE, yet likely reflects an understanding of the local population’s preferences for conservative Islam, rather than ideological or institutional links with political leadership. Indeed, the government has not used the presence of such figures to impose Islamist policies inside Qatar, even though some of their conservative social programs would likely hold popular appeal. What current literature seems to overlook is the ability of the Qatari regime to host influential individuals, not due to an ideological affinity, but simply because they are influential abroad. To the extent that this practice is a strategy, it has been in place for decades. In fact, Sheikh Khalifa bin Hamad Al Thani, himself a “progressive reformer” in support of Arab nationalism, who ruled from 1972-1995, developed a strong friendship with al-Qaradawi, who gave him religious instruction. Sheikh Khalifa, the same ruler who had ousted a Muslim Brotherhood-linked minister of education for an Arab nationalist, then, offered al-Qaradawi a Qatari passport. The fact that he insisted on al-Qaradawi’s continued presence in the Arabian emirate demonstrates the preacher’s appeal to Muslims who do not necessarily support the Ikhwan as an organization or even as an ideology. It also may have reflected Sheikh Khalifa’s understanding that naturalizing al-Qaradawi was politically expedient due to the preacher’s prominent position in the Muslim world.